She won the all-around cowgirl title at Cheyenne one year, then, to prove herself, returned the following year and conquered every event she entered. Mabel Strickland stood a little over five feet tall, was slim, and was known by her friends and family to be as gentle as a dove. Few would have guessed by looking at her that she was a star in the rough, grueling sport of rodeo. 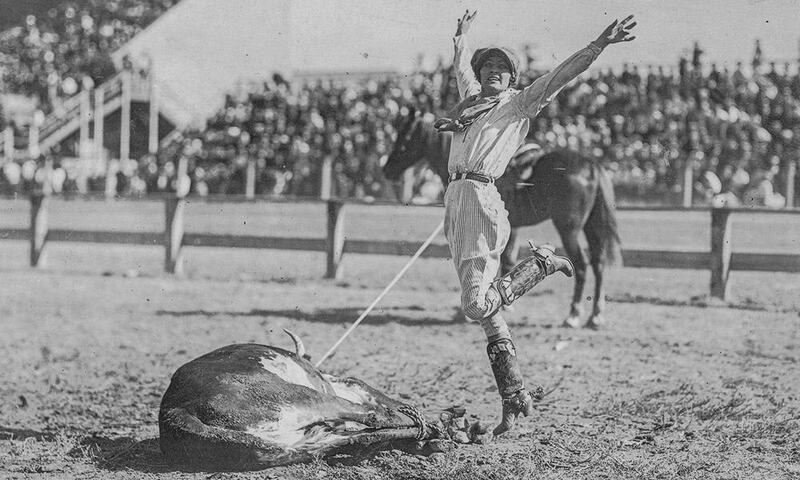 Her name was held in high esteem on every major rodeo circuit beginning with 1916, and thereafter for 25 years. Not a specialist by any means, she participated in every competitive rodeo event except bulldogging. When you think of calves averaging 345 pounds giving well-muscled cowboys trouble, it was difficult to visualize tiny Mabel Strickland throwing a calf to the ground and pinning the flailing legs. Her fastest steer-roping time was an impressive 18 seconds. She won the all-around cowgirl title at Cheyenne one year, then, to prove herself, returned the following year and conquered every event she entered. In the 1920s, she was awarded two special Hamley saddles for her winning ways in relay races held at Pendleton and Cheyenne. She was also a trick-riding expert and gave such exhibitions as jumping her horse over a car. Mabel was born in Walla Walla, Washington, in January 1899. She learned to ride at the same time she was learning to walk. She started her riding career in 1913 and first entered rodeo competition in 1916. She held top trick-riding honors for 10 years and appeared at Madison Square Garden rodeos numerous times. A spill there in 1926 almost ended her riding career. She was performing a trick in which she went under the horse’s neck and grabbed the saddle on the other side as the horse galloped around the arena. She lost her grip and fell beneath the belly of the horse. It took several weeks, but not only did she recover, she went on to win more riding honors. Mabel’s favorite riding horse was a Quarter horse named Joker, and before he came into her possession he belonged to a Texas sheriff who traveled the region with the animal tracking down outlaws. Joker took Mabel through more miles and rodeo wins than any other horse she owned. Mabel passed away in 1979 after a long battle with cancer. She was 79 years old.